Santa Barbara, CA, February 20, 2019 --(PR.com)-- Evolutions Medical Spa Celebrates 13 Years in Santa Barbara. 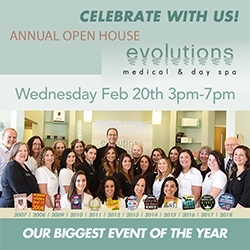 Evolutions Medical & Day Spa Anniversary Open House will be held this year on Wednesday, February 20, 2019 from 3:00 pm – 7:00 pm. Evolutions offers clients access to a luxury day spa for Santa Barbara’s best massages, facials, and body treatments, but it is recognized as a top-notch, cutting-edge medical spa as well. Founder and Medical Director Dr. Terry Perkins has staffed the spa with experienced and highly trained skincare professionals armed with the knowledge that each person's skin is unique. Each client is provided with a personalized skincare solution, utilizing the latest technology to achieve the best results.